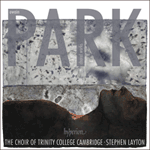 Park composed Beati quorum via in 2014, in response to a commission from the Wells Cathedral Chorister Trust. Park’s setting, like Stanford’s, is gracious and flowing—the melodic lines appropriately start to wander at the words ‘qui ambulant’—though, unlike Stanford, he underlines the law of the Lord (‘in lege Domini’) with faster and more rhythmically emphatic music before returning to the tranquil mood of the opening. In the closing bars, the sopranos and altos are directed to sing ‘like shimmering silver’.